Yaron Gal Carmel, LCMT, PSIP has worked as a bodyworker for over twenty years. 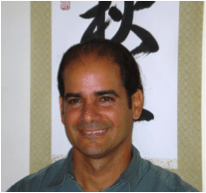 Yaron has studied with various masters and pioneers in the bodywork field such as Tom Myers, Christoph Summer, Koei Kuwahara, Hugh Milne, Judith Aston, Gil Hedley, Jim Asher and many others. An educator at heart, Yaron is a senior faculty member of the Kinesis School for Structural Integration where he teaches workshops in “Anatomy Trains”, advanced regional anatomy, and application of fascial release techniques. Yaron teaches for ” The Bodywork Education Project,” where he offers certification courses in Traditional Thai Massage, as well as his own method, Somatologic Moves, which marries Thai Massage and Structural Integration. His teaching style is known for its liveliness, with experiential exercises, hands-on applications, and attention to therapist self-care. Massage and movement therapists alike are inspired and moved by learning experiences with Yaron. Yaron is the owner of The Therapy Center for Mind and Body near Boston, where he maintains a busy private practice.